Hold onto your butts (and tissues), folks. The Centers for Disease Control and Prevention, in a press conference held Friday, announced that the current flu season is still raging, with no signs of letting up yet. Not only that, but assuming things hold, the flu could cause more illness than it has in nearly a decade, when two waves of a pandemic strain—the terrible swine flu of 2009—hit the U.S. throughout the summer and winter. Since the end of December, CDC officials said, the level of flu activity throughout all states but Hawaii has remained widespread. With each week, more people are visiting their doctors with flu-like symptoms, and the hospitalization rate has spiked. 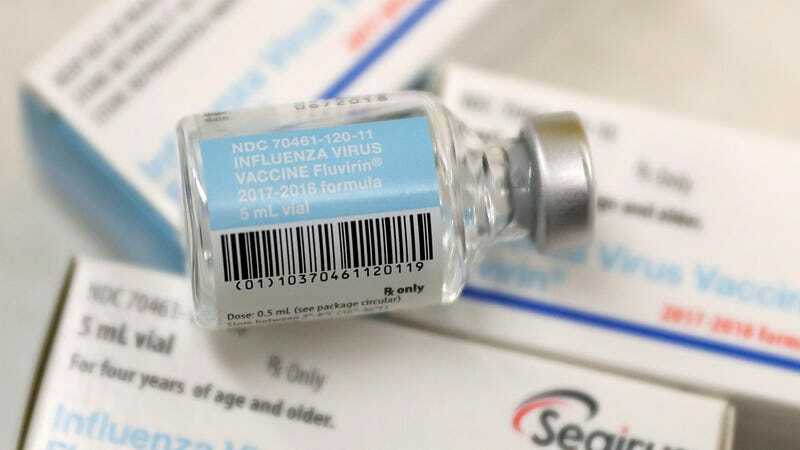 Because of that, it’s now thought that this flu season will match and possibly even pass the number of hospitalizations and deaths seen during the 2014-2015 season, which had been the record holder in recent years. That year saw around 710,000 hospitalizations and 56,000 deaths. “We’ll expect something around those numbers,” Dr. Daniel B. Jernigan, director of the C.D.C.’s influenza division, said during the conference, according to the New York Times. The flu strain causing most of the trouble, an influenza A subtype H3N2, is known for being especially hard-hitting. In regular circulation since the 1950’s, H3N2 tends to mutate faster than other seasonal strains, meaning that vaccines created against it earlier in the year don’t offer as much protection by the time it reaches the public in full force. Generally, H3N2 vaccines are around 30 percent effective at preventing the flu, though there have been concerns that an egg-based vaccine used in Australia last year may have only been 10 percent effective. The CDC has since said that the U.S. version was formulated differently so it should be as effective as normal. The CDC also updated its figures on flu deaths among children, which it monitors closely. As this week, there have been 37 reported pediatric deaths, up from 30 last week. But the true toll of deaths, both in kids and adults, won’t be known until the flu has run its course, since some deaths won’t get correctly tallied at first. As for the flu itself, we’re still in it for the long haul, with weeks to go before we can see the end of a tunnel. That also means, and this is a broken record: It’s still not too late to get the flu shot! Go get it. Even if the shot does take two weeks to start protecting you, and even if it only works a third of the time, it’s still worth it. It not only saves lives, but it also tends to make your flu experience less severe if you do end up catching it.